Do you feel betrayed and like there is no one to turn to? Well there are many other women who feel the same and benefit from support from one another. 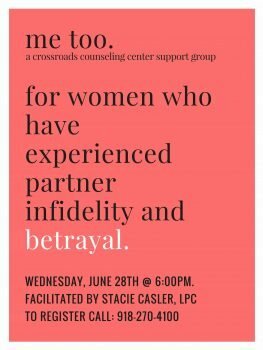 Join Stacie Casler at Crossroads June 28th 2017 at 6pm for an evening of encouragement and comfort for women who have experienced partner infidelity. To register, please call our office at 918-270-4100.